SATURDAY APRIL 14TH – Lower Paymaster Guzzler Rebuild – NDOW / NBU – Complete rebuild of an existing guzzler including a new 72′ x 80′ apron, 6 new storage tanks, a new drinker and fencing to be build adjacent to the existing 4,600 gallons of water storage for a total capacity of 17,000 gallons. Included is the map and coordinates to the camp / guzzler site. As usual all major turns will be marked with orange surveyors tape and lathe starting from the turnoff on Hwy 95 east of Hawthorne. The guzzler site can be reached using either ATV/UTV’s or 4 x 4 vehicles. 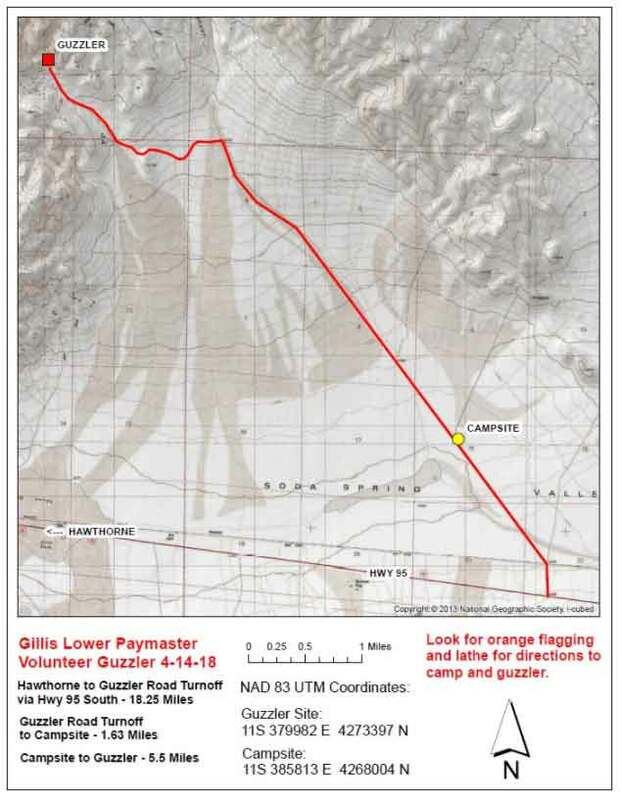 The designated camp site is 1.6 miles off the Hwy 95 and the road should be in good condition and accommodate travel trailers provided we don’t have a major weather event the week prior to the build. There will be people camping both Friday and Saturday nights and NBU will provide lunch (Port of Subs sandwich with chips and a drink) and dinner (New York Steak, beans, salad, French bread) on Saturday. NBU will bring the necessary tools required for the build on Saturday and please dress according to the weather…bring work gloves. We will all meet Saturday morning (7:00AM) at the camp site for a safety briefing, Q & A session and to fill out any required NDOW paperwork. Thank you for your support and hope to see you out there!